The Development of Aluminum Plastic Recycling Machine _ PCB recycling machine,cable wire recycling machine,E-waste recycling plant,precious metal refining machine system,E-waste shredder,plastic and metal recycling production line,copper electrolysis system-Zhengzhou Zhengyang Machinery Equipment Co.,Ltd. The recycling of waste aluminum is friendly for the whole world environment.With the development of the world economic ,the recycle technology of the waste is develops at a high speed.The aluminum plastic recycle machine can use the recycled aluminum at a right way,It is good for our environment. The aluminum plastic recycled machine improved at its technology.On the basis of the original equipment, add Circular screen and water-cooled aluminum material grinding device,and solve the metal and non-metal separation not clear at high temperature.The equipment can recycling the aluminum and plastic effective. 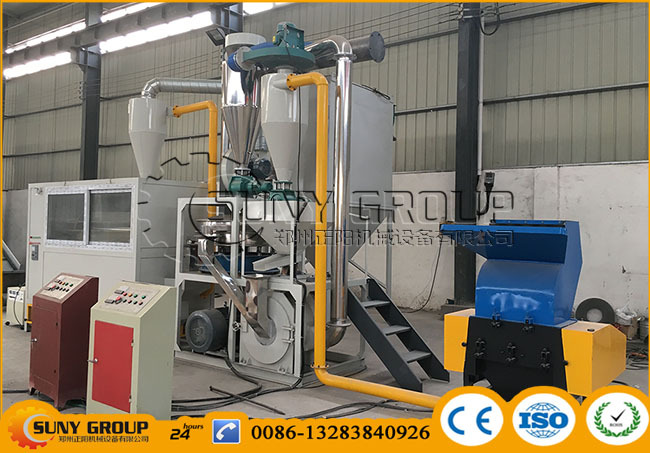 The working process include Material→crush→Grind→circular screen→Electrostatic separator→Aluminum and PVC/PE powers.The equipment is the basic of the waste recycle filed.It can complete the effective reuse of resource.